Wearables, Wearables everywhere, but not a one for me? There’re a wide variety of wearable technologies that collect every detail from your naptimes to your latest fitness victories. Once you’re home with the box utilizing the mechanics daily, that’s when the true experiments begin. These unique pieces are meant to facilitate progressive changes by fitting into your life seamlessly. But high expectations lead to disappointment, and that is when the cracks start to show. Withings, a Parisian startup which has recently reverted back into an independent company after 2 years with Nokia, has finally released The Move Watch. Evoking a classic staple for the wrist, this hybrid tracking timepiece will serve its intended purpose. But let me be clear; This is NOT a smartwatch. There is no touch screen, no digital display or notifications. This device is an activity & sleep tracker with an 18-month charge capacity. If you are looking to be out of reach from city life for a while, this may be the right choice for you. The overall design has been preserved, staying true to the unisex sleekness of its siblings’ motif. The visual aim of a traditional watch face with the third hand directly illustrating your activity is met with an expanded color scheme. There are 5 colorations to choose from, creating a more bespoke touch. With murmurs of even more colors launching later in the year, the company promises customization as flexible as their silicone wristbands. The fashionable accessory can go from the boardroom to the beach without worry, thanks to an on-point waterproofing game. While it is lovely to see Withings express its creative side, the decision to swap out the original glass or sapphire front has sadly backfired. The plastic scratches easily, allowing dirt and grit to access the clock face, invoking a rather tacky effect. By focusing more on the character design than on the build-quality, we are left with a cheap imitation of a smartwatch. It isn’t just a question of quality, but of durability. Although the lower cost reflects the lack of more damage-resistant materials, it still does the job. Automatic tracking comes standard. Whether its 2 am or 2 pm, once motion is detected every detail is laid out in the Health Mate App. Unfortunately workout sessions require manual input. If you forget to push the single button on the side of the watch, the program will overlook it as well. The watch’s precision monitoring falls short of any wearable competitors as, without heart rate scans, it must rely solely on movement. For a more meticulous picture on how to improve your sleep patterns, the non-wearable sleep tracking system from Withings presents far better findings. Withings Sleep offers a reliably comprehensive analysis when compared to the Move, as it evaluates heart rate, snoring, movement, and varied sleep cycles. Contrary to this smart home sleep coach, the Move’s tracking system itself is not 100% accurate. 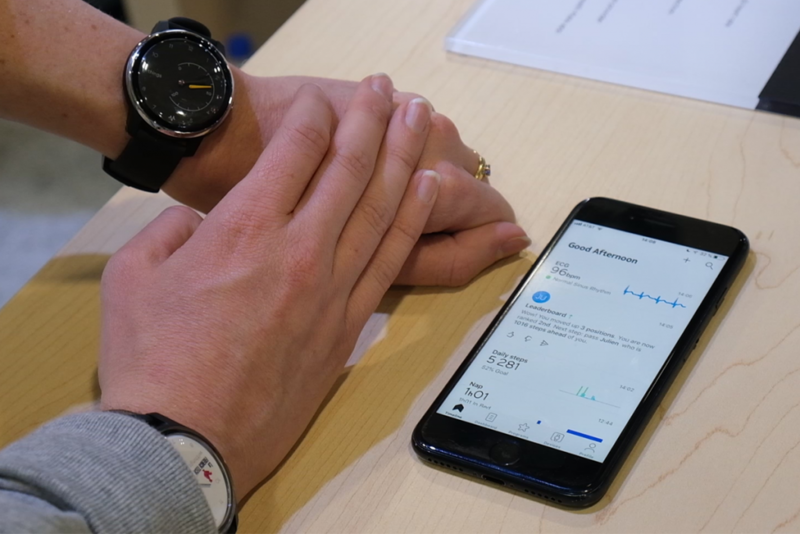 If you are a loyal brand ambassador to Withings, the wide range of connectivity offered by the makers is quite good. Every product produced by the company is compatible with IOS & Android devices, though Wifi & Bluetooth capabilities are varied. If you are looking to establish a smart home, you will have to rely on the other options in the Withings suite of merchandise. Connection is not something The Move offers. In fact, this watch is the antithesis of connectivity technology. As mentioned above, battery life is unmatched on the market. Whether you are heading out for a last minute business trip or a three-month trek out into the mountains, this watch has you covered. Although 5 days of internal data storage between syncs and a low Bluetooth energy are present, this may not be the right buy for anyone who already owns a full smartwatch with prevailing applications. But for anyone seeking “off the grid”-like peace, this can be a decent compromise. The Move would be a smart first step into the world of hybrid watches. There are no bells or whistles. Withings strips away the noise, rebuilding the foundation of what affordable wearable technology can offer. If you feel overwhelmed by the sweeping data collected by something like a Fitbit, then the uncomplicated Move may be the better fit.